Healthy Diets for Kids - What's all the fuss about healthy diets for children? What's all the fuss about healthy diets for children? Studies show that healthy diets for kids are vitally important. Eating healthy food in a positive social context has an enormous influence on children’s health and eating habits later in life. Are kids eating enough healthy food? No, many aren’t. According to surveys such as the Australian National Nutrition Survey, 85% of 12-18 year olds don’t consume the recommended 4 daily servings of vegetables. 30% of boys and 36% of girls in this age group ate one serving of vegetables or less each day. The results of this survey are even more disheartening when you consider that hot potato chips was measured as an allowable vegetable serving. Hot chips are not high on the list of healthy foods for children! Potatoes were the most frequently consumed vegetable for kids in all age groups. Surprisingly, on average children consumed more vegetable servings than fruit servings. Removing fruit juice from the accepted fruit servings made this even more apparent, with less than 50% of children and 25% of adolescents having adequate fruit intake. Apple was the most commonly eaten fruit across all age groups. Children tend to carry the food preferences and eating habits formed during childhood with them into adulthood. Providing healthy food for your kids sets them up with healthy eating patterns for the rest of their lives. There's not just the habit of eating healthy food, but also having the knowledge and skills to select and prepare healthy meals for themselves. Children who consume the recommended daily intake of fruit and vegetables reduce their risk of chronic diseases later in life. There is solid scientific evidence that eating fruit and vegetables reduces the probability of illnesses such as cancer, stroke, heart disease and hypertension. Although most of these diseases are unlikely develop in children, the risk factors for these illnesses are established at an early age. What can parents do about healthy diets for kids? 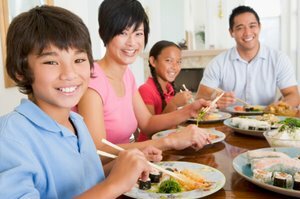 Sorry to add to the burdens of already stressed parents, but getting kids to eat healthy food is super-important! Here’s a list of some useful strategies you can try. If parents have a low vegetable consumption, their children are likely to have a low consumption level too. Eat your vegetables – and make sure your kids see you do it! When families tend to stick to familiar favourites rather than eating a variety of vegetables, their average vegetable consumption tends to be low. So experiment and eat a rainbow of vegetables at family meals. Parents can get disheartened when healthy foods are rejected the first couple of times they’re offered to kids. Ironically, your little treasures are more likely to try something after repeated exposure. So keep on offering it up, encouraging them to try but not forcing them. One day your dreams might just come true when your little darling takes a nibble of that tasty green broccoli. Children attach more importance to the taste, texture, appearance and fun value of foods rather than nutritional attributes. Present vegetables in colourful ways, using interesting shapes and arrangements. Apparently, talking about the consequences of not eating vegetables makes them even less desirable to kids. (Whoops!) Talk up the benefits such as energy, immunity and growing stronger rather than what will go wrong with their bodies if they don’t eat their greens. Convenience food options tend to be squeezing healthy meals off the family menu. There’s a perception amongst some parents that preparing vegetables is too time-consuming. Either make time, or familiarise yourself with the refrigerated section of your supermarket where fresh vegetable options are becoming more available. You must believe! When parents don’t credit the importance of vegetables to health, kids tend not to either. Back to Kids Eating Healthy from Healthy Diets for Kids - What's all the fuss about healthy diets for children? Back to Healthy Eating Guide home from Healthy Diets for Kids - What's all the fuss about healthy diets for children?